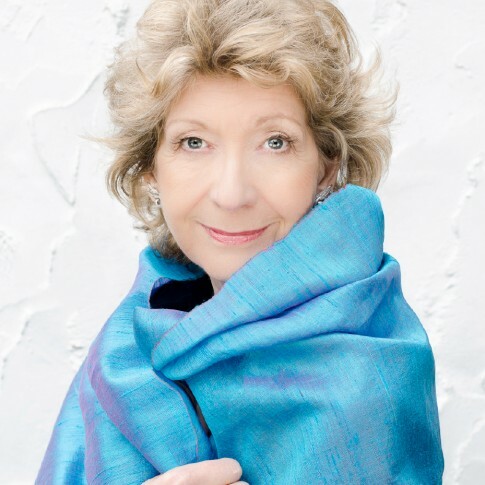 Dame Felicity Lott was born in Cheltenham, into a family of amateur musicians. From an early age she learnt piano and violin, and took singing lessons. Her real love was the French language and she took a degree in French and Latin at Royal Holloway College, University of London, with a vague idea of becoming an interpreter. As part of the degree course, Felicity spent a year as Assistante d’Anglais in a school near Grenoble. Besides her teaching duties she enrolled at the Conservatoire de Grenoble and found an excellent singing teacher who encouraged her to pursue her singing studies. After returning to England to take her degree, she obtained an Associated Board scholarship to the Royal Academy of Music, where she studied for four years, leaving in 1973 with the Principal’s Prize. In 1975 Felicity made her debut at the English National Opera as Pamina in Mozart’s Magic Flute, in 1976 she took part in the first performance of Henze’s opera We Come To The River at the Royal Opera House Covent Garden. In that year also began her long relationship with Glyndebourne, with the role of the Countess in Capriccio on the Tour, and in 1977 she appeared at the Festival for the first time, as Anne Trulove in Stravinsky’s The Rake’s Progress. Since then, Felicity has appeared at all the great opera houses of the world : Vienna, Milan, Paris, Brussels, Munich, Hamburg, Dresden, Berlin, New York and Chicago. Her many roles include the Marschallin (Rosenkavalier / Strauss), Countess Madeleine (Capriccio / Strauss), Arabella (Strauss), Christine (Intermezzo / Strauss) Countess Almaviva (Le Nozze Di Figaro / Mozart), Fiordiligi (Cosi Fan Tutte / Mozart), Donna Elvira (Don Giovanni / Mozart), Ellen Orford (Peter Grimes / Britten), The Governess (The Turn Of The Screw / Britten), Lady Billows (Albert Herring / Britten), Louise (Charpentier), Blanche (Les Dialogues des Carmelites / Poulenc) and Elle (La Voix Humaine / Poulenc). Conductors she has worked with on the opera stage include Andrew Davis, Bernard Haitink, Vladimir Jurowski, Carlos Kleiber, Antonio Pappano and Simon Rattle. More recently, Felicity has shown her affection for operetta. In 1993 she sang the title role in Lehar’s Merry Widow with Glyndebourne Festival Opera on a recording for EMI, but she had sung the role on stage in Nancy as well as in Paris in the 1980’s. In 1999 she appeared as Rosalinde in Johann Strauss’ Fledermaus in Chicago. Her performance as Hélène in Offenbach’s La Belle Hélène at the Chatelet in Paris, in a production directed by Laurent Pelly and conducted by Marc Minkowski brought her a great success in 2000. In the 2004-2005 season Felicity appeared with the same team as Offenbach’s La Grande Duchesse de Gerolstein. Felicity is well known as a concert artist, working with all the great conductors and orchestras. She is an experienced recitalist after many years of singing with Graham Johnson, whom she met when they were students at the Royal Academy of Music. Her repertoire includes songs by Strauss, Schubert, Schumann, Wolf and Brahms as well as the masters of French Mélodies. As might be expected, Felicity is also very fond of English songs, particularly those of Benjamin Britten and William Walton. She is a founder member of Graham Johnson’s Songmakers’ Almanac.